Siberia is large geographical region of northern Russia and Asia, consisting of giant swathes of boreal forest fringed by freezing tundra. Given the frigid temperature drops and absence of long, warm summer months, there are few reptiles living in Siberia, and none in the frozen north. Three snake species can be found in southern Siberia, and survive through thermoregulation. The grass snake (Natrix natrix) is a nonvenomous water snake found near freshwater streams, rivers and lakes. A dark brown to dark green in color, the grass snake is, on average, just over two feet in length. 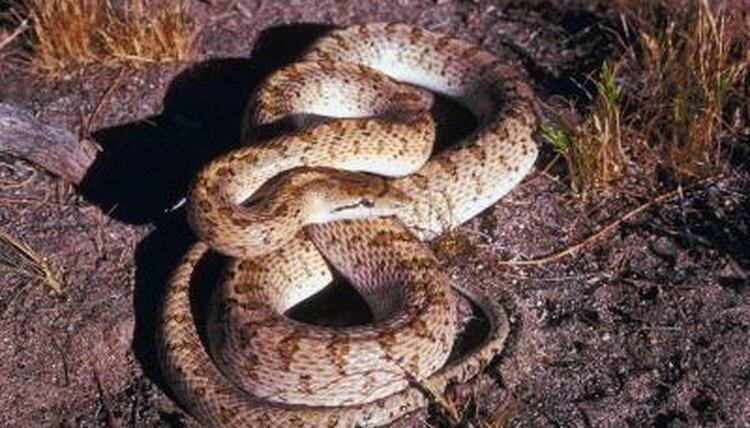 Specimens of Natrix natrix have been found to measure over six feet, although this is rare. The grass snake feeds almost exclusively on amphibians such as frogs and toads found in his habitat, but can catch fish and mammals if no other prey is near. Also known as the Siberian moccasin, the Siberian pit viper (Gloydius halys) is a venomous snake found on the southernmost steppes of the Siberian region. The Siberian pit viper ranges in color from brown to gray, depending upon what geographic location she inhabits. Pit vipers are so called and recognized for the deep cavity, or fossa, found between the eyes and nostrils. These pits indicate the pit organ, a complex organ that allows the Siberian pit viper to "see" radiant heat, aiding her in hunting, and thermoregulation. The Russian rat snake (Elaphe schrencki), also known as the Siberian rat snake, is an officially protected species in Russia. The Russian rat snake inhabits mostly wetlands as well as some rocky hillsides, and feeds primarily on small rodents, birds and eggs. The Russian rat snake found in Siberia is very dark green to black, with light gold banding segmenting the body. He can grow to two feet in length, and is known for being curious and fearless -- though not overly aggressive -- in nature. In 2008, researchers discovered evidence of several now-extinct snakes that inhabited Siberia during the Miocene epoch, an era that occurred 23 to 5.3 million years ago. The grouping of six snakes resembled those found in the Miocene era of Europe, and included a viper, three Colubridae, a Boidae, and an unknown genus. The exact species are not known. The importance of this find stresses the possibility that groups of snake fauna in Siberia may be homogeneous -- or having one source -- with groups of snake fauna in Europe. Russian Journal of Herpetology: A Northernmost Record of the Grass Snake (Natrix natrix) in the Baikal Lake Region, Siberia; S.N. Litvinchuk et al. Mongolian Red List of Reptiles and Amphibians: Kh Terbish et al.